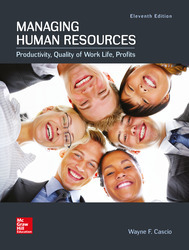 Managing Human Resources 11e links the relationship between productivity, quality of work life, and profits to the various human resource management activities. Research-based and includes strong links to the applicability of this research to real business situations. A new chapter - Chapter 2, HR Technology - has been added to the 11th edition to reflect the increasing role of technology in managing human resources. CONNECT: A highly reliable, easy-to-use homework and learning management solution that embeds learning science and award-winning adaptive tools to improve student results (applied and practical, results-driven technology.